As our adventure comes to and end we wanted to share with you a great Orca video The Captain took on his Iphone. The best part is at the end! We are currently in Puget Sound heading for Elliott Bay. Thanks for sharing our adventure. I bet you are all wondering if the fishing excursion was a success. It was! After arriving at Dent Island Resort we supped on some lunch on the lovely view deck and then headed out with Herb. Herb has lived in and around Dent most of his life. He’s “Papa Bear” on the VHF radio and the winter caretaker for Dent Island. It became very clear, very quickly why we were not catching any fish on our own. We had no downrigger with a 10 lb weight so our lines were not going down deep enough — that of course and the years of knowledge and local experience catching fish in general and fish around here specifically. perspective. The guides communicate via VHF and not much was happening. As we passed other fishing boats, people were napping and dancing. Not a good sign, Herb said. But after about 2 hours at the head of Fredrick Arm, Herb saw an imperceptible wiggle of the line (that both the Captain and First Mate missed entirely) and he leaped into action, releasing the 10 lb weight from the line with a powerful yank. Herb then handed the pole to the Captain and the First Mate grabbed her camera. The fishing pole that snagged our fish was Mike Marshall’s pole. From Billie’s fishing stories we think this is the biggest fish Mike’s pole has ever snagged. After a good fight, the Captain reeled our 9 lb Chinook next to the boat where Herb scooped him up with a net. A great success! world. 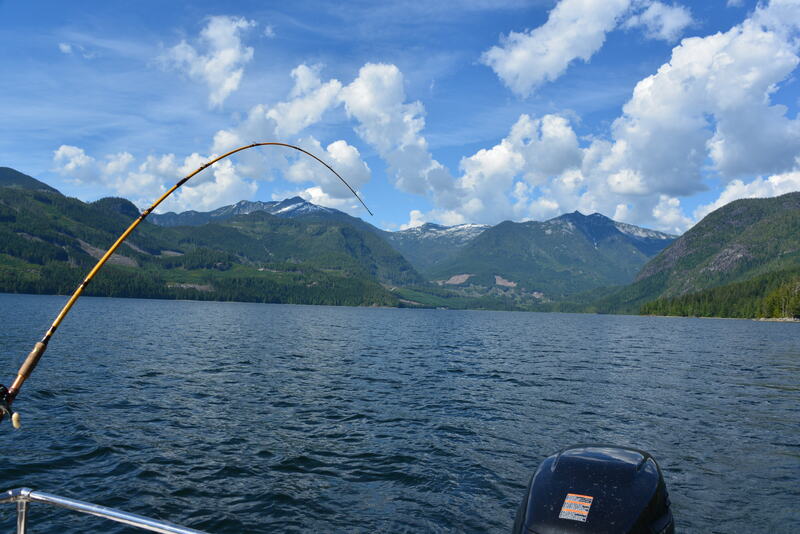 They spend a month up in Dent every year fishing and frolicking in North Desolation Sound. 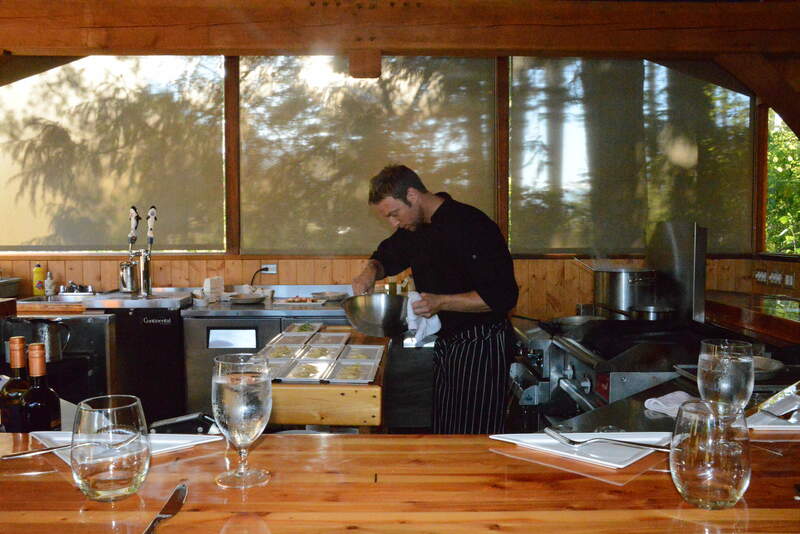 Dinner prepared by Chef Pascal and his assistant Misty was scrumptious: scallop seviche and chilled watermelon soup; dungeness crab ravioli with chives and scallions; duck comfit and wild mushroom risotto with truffle oil (the winner of the night! ); grilled halibut tacos; steak asparagus and chive mashed potatoes (really not necessary, but yummy); and a dessert of grilled pineapple, sorbet and cashew crumble (the grilled pineapple was a fantastic idea). Obviously we rolled ourselves out of there very, very full. When we woke Monday morning we were still full from dinner and after an elixir and some coffee we headed to the cute little workout cabin to run on the treadmill there. The workout cabin at Dent Island in on the water and has a spectacular north view up the channel and while running we were treated to our first view of Orcas! 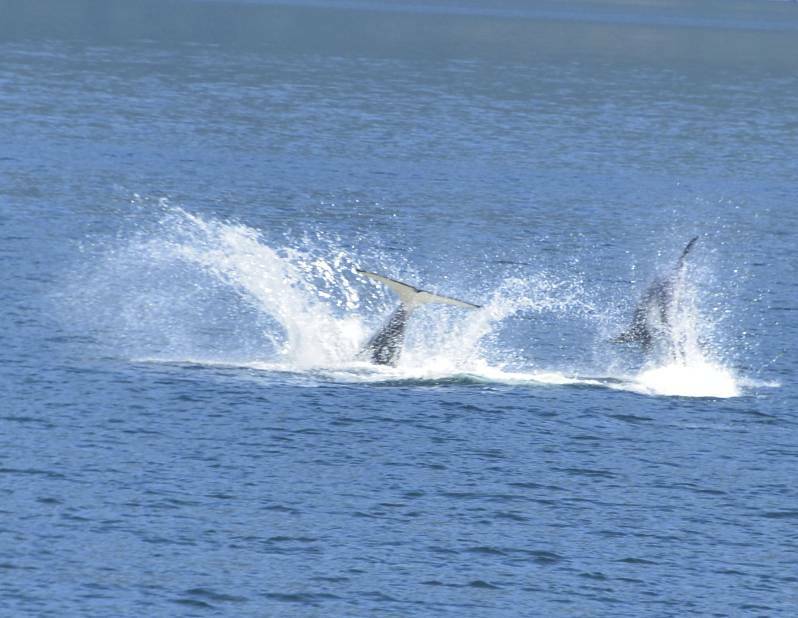 Clearly we caught our fish just in time, because when the Orcas swim through, they don’t leave many fish for the humans to catch. What we did not know is that this was a merely a foreshadowing of the “Epic Orca Experience” we would have later in the day. After our run we soaked a bit in the hot tub before shoving off with the slack tide around 11. 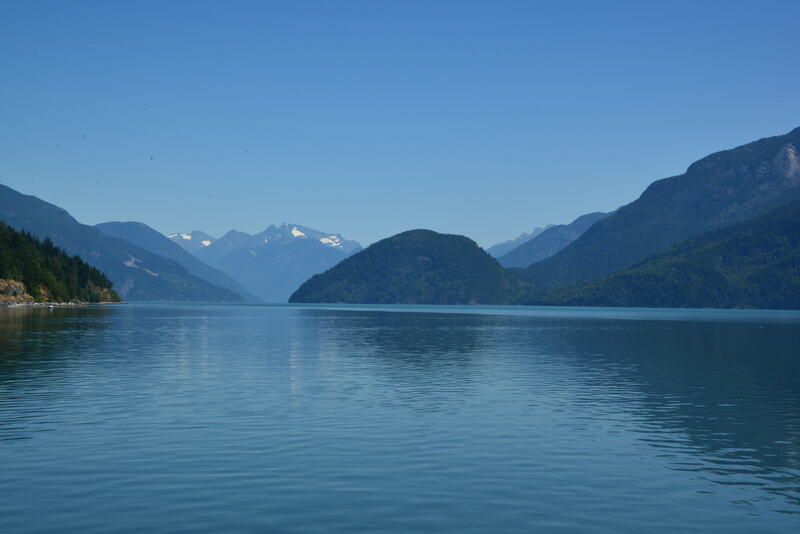 We headed into Bute Inlet one of our favorite spots to enjoy the views and eat a light lunch while underway. 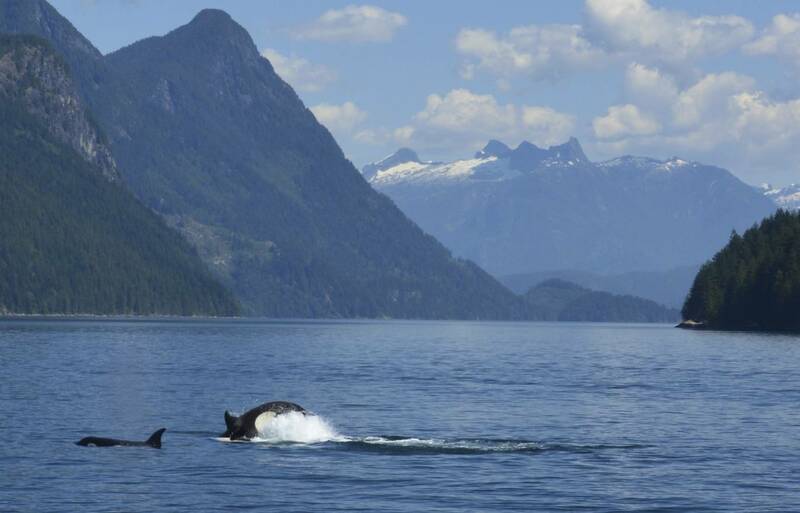 As we were cruising south out of Bute Inlet, past Sonora Island, we began to monitor “orca radio” on VHF channel 7. 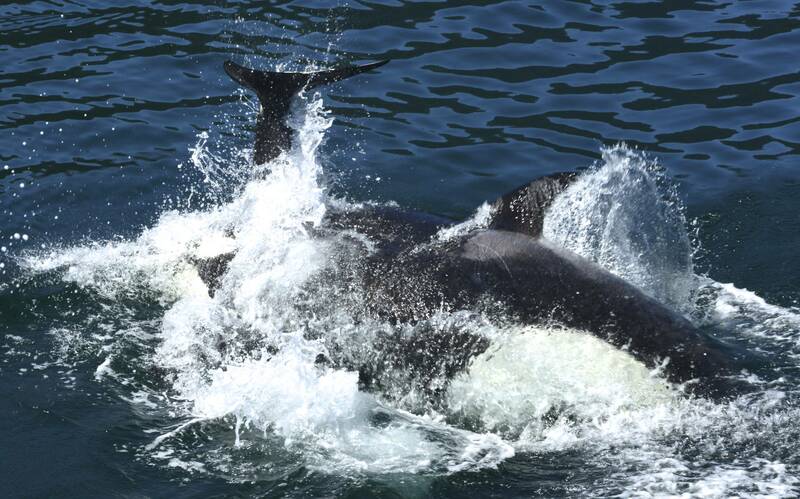 Around Dent Island, there are a lot of orca tour boats, and they all share information on VHF channel 7 about where the beasties were last seen, along with dolphin and bear sightings. 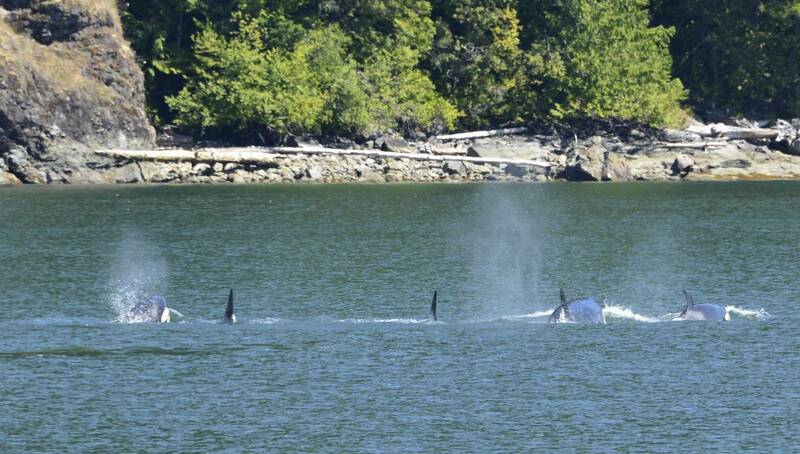 There was some talk about orcas in our general area so we brought out the binoculars and searched. As we approached the mouth of Bute Inlet and turned south we spotted a pod of Orcas in the distance. What we didn’t know then was that this was the beginning of a 2-hour Orca Odyssey. 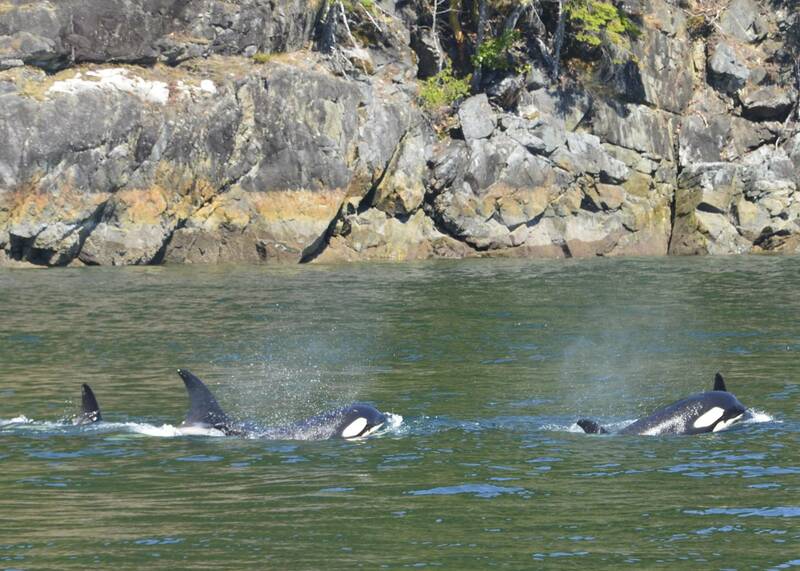 A pod of five Orcas followed our path as we traveled towards south then east toward Toba Inlet and Pendrell Sound. 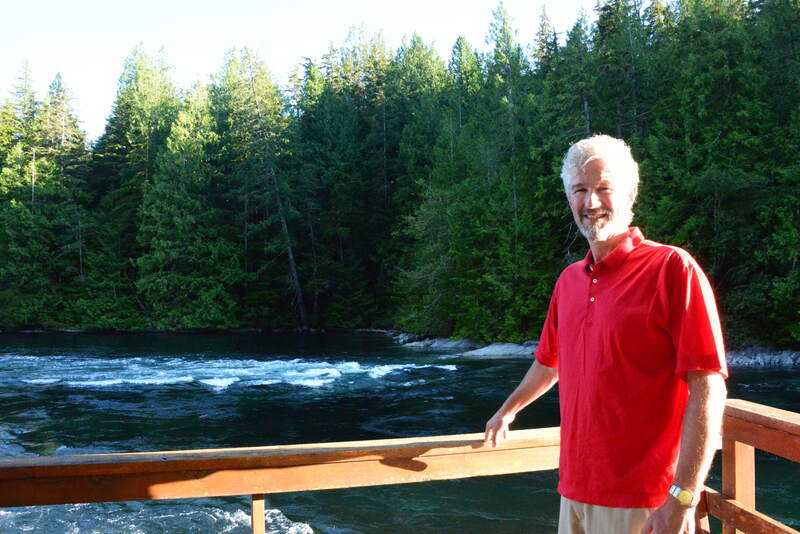 Our goal was to get to Pendrell Sound where the water is the warmest in Desolation Sound (mid-70’s) for some swimming. We didn’t know we would be entertained by Orcas for almost half the trip. And we had the Orcas all to ourselves – the tour boats never appeared. The First Mate took over 1,000 photos and it took us over an hour after dinner to go through them to pick out some of the best. It’s hard to explain in words the enchanting experience. 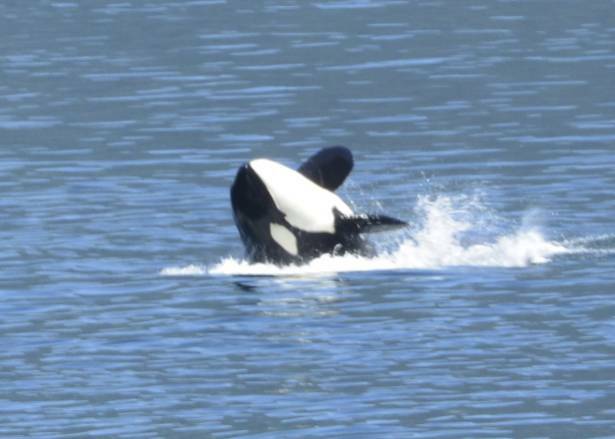 We were cruising slowly, listening to music, dancing in the sun and taking pictures of the orcas as the orcas swam along the shoreline on our port side. 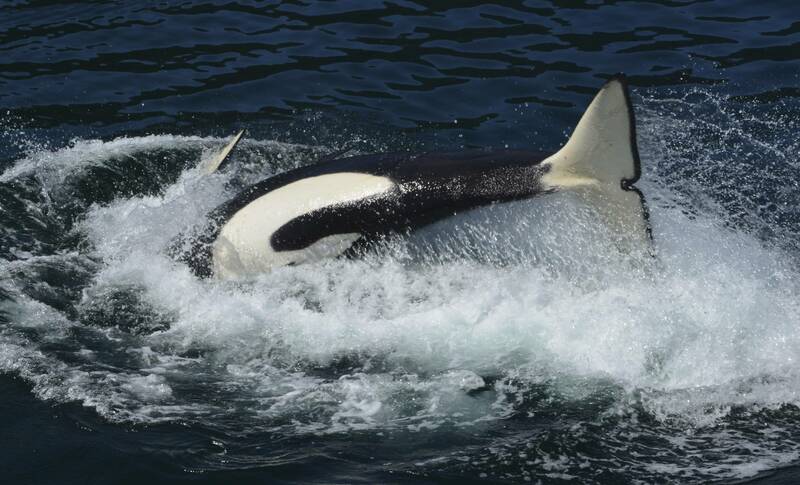 At the intersection of Raza Passage and Ramsay Arm, just SE of Francis Bay, the Orcas began to frolic in the more open area. We watched them jump and play and then they crossed right under the True Love before we said our goodbyes. They headed back up north and we headed east down Pryce Channel to Waddington Channel before we turned into Pendrell Sound. Note to Saul, Jasmine, David and Baby James: we can’t wait to share this with you! 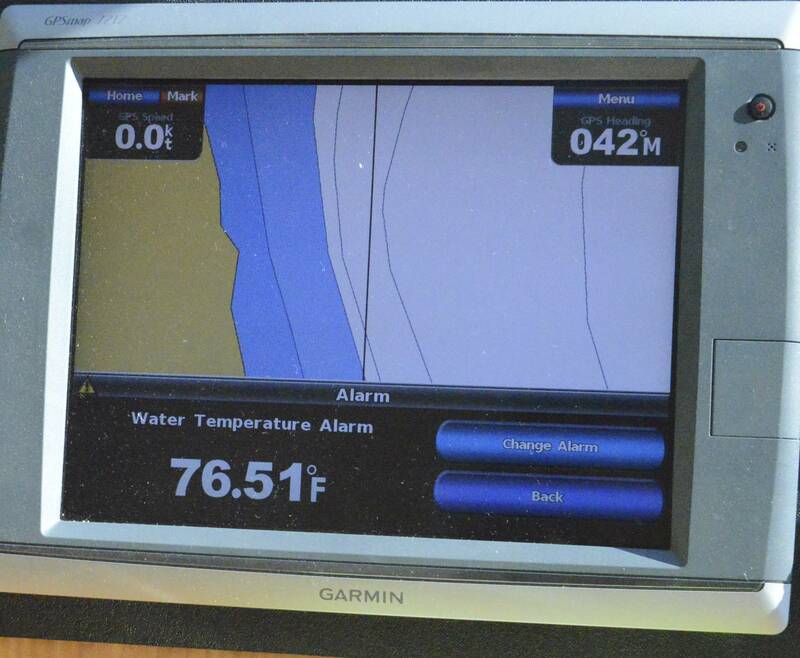 As we headed into Pendrell Sound we watched the temperature in the water rise. It briefly hit 76 degrees. We dropped the anchor and planned to go for a swim, but then stopped. Why? 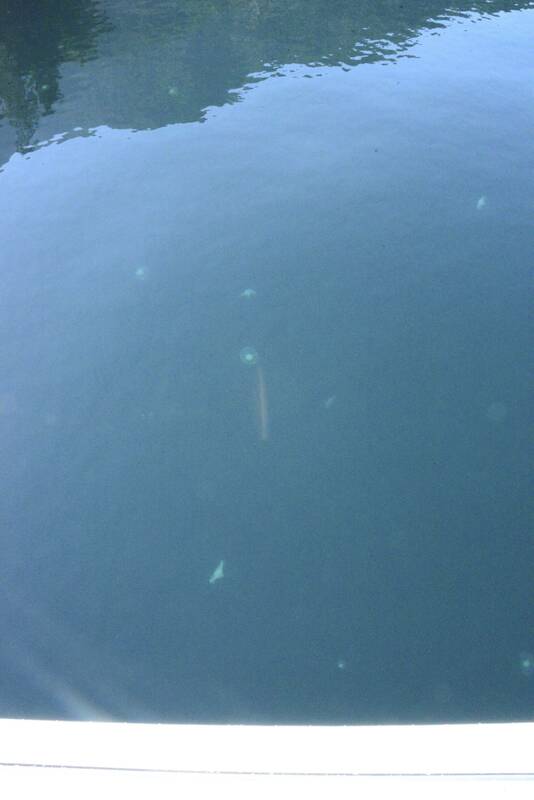 About 20 feet down in the crystal clear water were hundreds of huge jellyfish. The First Mate was extremely concerned. But, after we watched for quite a while and confirmed that not a single one was swimming up to the warm water at the surface, we decided to take a chance. The First Mate was still uneasy (obviously a latent jelly fish phobia) so the Captain jumped in first and after awhile we pulled out the snorkels and goggles and floated while watching the “jelly-galaxies” float below us rewarding the crew of the True Love with another enchanting, magical experience. After our swim we kayaked a bit and secured our shore tie with some team kayaking. After a shower we grilled up our Chinook and said a special prayer of thanks. Before collapsing in bed we took a look at the stars and were lucky enough to catch the space station passing overhead with its tell-tail speed and bright to fading reflection. Life really does not get much better than this! Our morning in Pendrell Sound began with a long kayak and then a swim before we raised anchor and headed south out of Desolation Sound. We ended up in a wonderful little anchorage we found last year on the north side of Lasqueti Island in a quiet little gunkhole in the Fegen Islets. The sounds of the wild entertained us as we watched a spectacular sunset.Eagles, herons and seagulls flew by as about 20 very vocal seals called out with strange guttural sounds and splashed in the water. Tomorrow we will head further south past Nanaimo, through Dodd Narrows, and onto Poets Cove on South Pender Island. After a calm and uneventful cruise we are safely anchored in Poets Cove, having dinner and drinks and catching up on our email and blog posts! 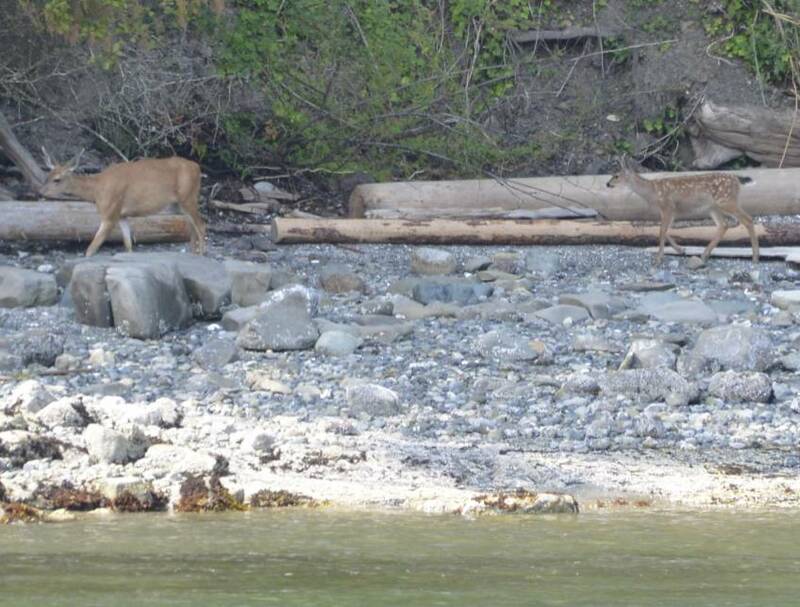 The only fun wildlife we saw today was this mother and fawn deer just south of Dodd Narrows. Our plan is to chill here for a couple of days and then possibly head out to Sydney to see some friends before traveling back to the USA on Saturday. The Captain and First Mate of the True Love!